Now extended through March 2nd! Edward Bond’s miscreants have some competition for Theatre’s Most Twisted Youngsters in Brett Neveu’s grisly dark comedy, The Earl. The Inconvenience’s revival marks the ensemble’s first professional production and the play’s third presentation, following an independent film adaptation by Jim Sikora four years ago and A Red Orchid’s original six-month run in 2006. From the looks of it, The Earl’s blood is still pumping strong. Strong, or at least bountiful, gushing from the limbs and noses of its characters and streaming down the walls of its set. The story is straightforward: three brothers reunite in an abandoned basement office for a high stakes game of physical abuse. Think bloody knuckles, but the Olympic version, with faces and knees substituting for knuckles and crowbars substituting for quarters. Why? Probably for the same reason children in school yards voluntarily play “wall ball” (the innocent title doesn’t imply the notorious “no-block crotch-shots rule“, does it? ), or the more presumptive “smear the queer.” Who knows. The rules of the brothers’ contest are never made quite clear–there’s a lot of counting and letters and special exceptions–but it’s not for us to know the details, is it? As Artistic Director Christopher Chmelik puts it in his program note, “[There’s] no judging panel or officials with the final say. The brothers wrote the rule book,” and that book remains a secret. Sick as it may be, the in’s-and-out’s of the unnamed game are honored with a special family bond not extended to outside ranks. So, when famous action star Lawrence Stephens (played with a nice blend of kitsch and menace by Danny Goldring) is invited to join the brawl, assuming the role of an “Earl,” the game takes a brutal turn for the unexpected. Like any good thriller, Neveu’s text layers its release of information slowly and unpredictably. Director and A Red Orchid Literary Manager Duncan Riddell paces the action carefully. I didn’t want to see too much, but I couldn’t look away. It’s a ballet of watching and wincing. When violence does erupt, Fight Choreographers Chuck Coyle and Ryan Bourque don’t disappoint. Theatre isn’t the greatest outlet for action (at least in the “wham-bam” sense), so fight choreography typically amounts to aggressive dancing. With the help of a collaborative young cast, Riddell overcomes the form’s limitations and uses the full visual and aural spectrum to create an exhilarating illusion. It’s fair to say that The Earl has more balls than brains, but that’s not to say it‘s dumb. This is an impressive, quick-witted ensemble, and the young trio has built a fascinating, mostly unspoken family dynamic. Among the sadomasochistic clan is Ryan Borque (Kent), a gangly, giggly ball of tics. He’s the severest case of arrested development of the group, and brings an estranged, juvenile sense of joy to the chaos around him, even when injured. Bourque is captivating, remaining charismatic with a broken nose. 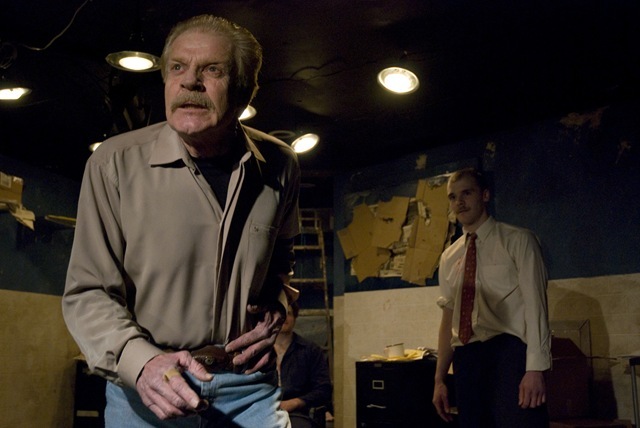 Likewise, Walter Briggs (Peter) and Chris Chmelik (Rick) know their backgrounds and supply the given circumstances that raise the show above the level of wrestling match to bold work of theatre. 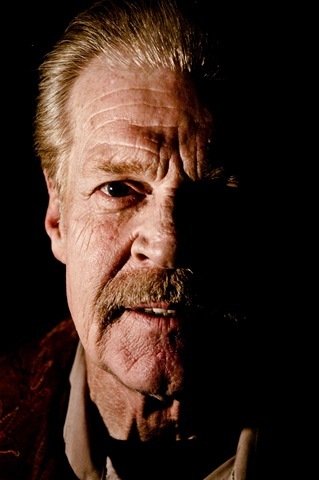 The Earl works as a one-act, but when the house lights came up for curtain call, I was hoping we were at intermission. The dramatic ground work and characterization are laid for a full-length play, and though the show is structurally complete, it did leave me wanting to see more story fleshed out. It originally ran as a late-night show, and likely works better with that mentality going in. But even at 8, it’s a thrilling little piece of pulp fiction. And for that, I’m game. The House Theatre of Chicago isn’t known for their gloominess. They often dip into darker subjects, especially death (Dave DaVinci Saves the Universe, The Nutcracker – our review ★★★½), sometimes drugs (All the Fame of Lofty Deeds – review ★★★), and, once, children killing each other with metaphorical handguns (Girls Vs. Boys – review). Their newest offering, Odradek, a riff on Kafka via Brett Neveu, is easily the bleakest story I’ve seen by the puckish group. The promotional material compares the play to Hitchcock, and in a semi-disclaimer, artistic director Nathan Allen warns that the “show is scary.” I firmly believe that the hardest emotion to evoke in an audience is not glee, or sadness, or despair, but fear. To be honest, Odradek never really scared me. And it’s not very Hitchcockian; it feels more like “Saw” meets Beverly Cleary. 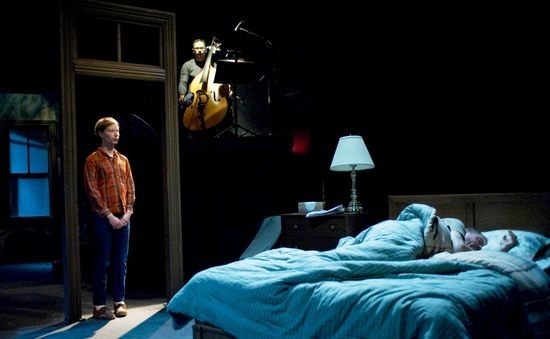 The play is beautifully realized by designers Collette Pollard and Lee Keenan. The play works best when seen as performance art, not a intellectual venture. Neveu and Dexter Bullard, two newcomers to the House, want this play to be both a tragically complex story and a macabre poem. They can’t nail down either. Neveu’s language is delightfully lyrical, but it doesn’t make for a coherent piece of drama. Realities, fantasy, and hallucination are blurred and the three characters’ motivations are convoluted. However, the show still takes the audience on a ride in true House style. The play centers around a Boy (Joey Steakley), who comes from a broken, but not abusive, home. He lives with his Father (David Parkes), who enters into an ethically-questionable romance with the Boy’s Doctor (Carolyn Defrin). 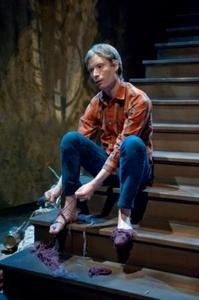 The Boy, on the other hand, enters into a relationship with a monster that lives under the stairs, Odradek. Slowly, the Boy slips down a path of confusion and self-mutilation. The plot has a few holes, which I’ll wager are intentional. The Doctor is pretty clearly a primary care physician, and the Boy very clearly requires some facetime with a psychologist. The Boy’s wounds provided another puzzle, because it wasn’t clear if they were imagined or actual. As the play progresses, the grip on reality loosens and every aspect of the story comes into question. The Boy’s affliction is linked to his parent’s divorce, but not much is explained. Neveu relies heavily on images, metaphors, and anecdotes for mood, but none of these provide stakes for the Boy. Colors are especially important—the Doctor asks the Boy what color his mother’s eyes are, while Odradek quizzes him about the hues of blood and sinew. But these tangents don’t explain why he misses his mom or why he chooses to hurt himself. Even with the stylistic clashes, the cast handles the play well. Parkes’ performance is fascinating to watch in his House debut. He gives the Father a gritty, Chicago-style treatment that isn’t found in many House shows. Defrin, always a pleasure, plays against him decently, even though she’s more presentational. Steakley comes off zombiefied in a challenging role, and his age is very hard to pinpoint (I sort of figured he was around 25 but still living at home). He hits astride as his story unravels. Infusing the company with new blood this season is a truly refreshing idea. In recent years, the House seemed to be stumbling at times. Odradek is a worthy venture and dives into territory that the company had successfully plunged into in the past. But it lacks heft. The play doesn’t reveal much about mental illness, divorce, or a connection between the two. Its value lies in how it strikes the ear, the eye, and the soul – not the mind. Will Cooper calls himself an “accidental” playwright. Apparently, he took a playwriting course after his wife paid for one but couldn’t go. In a rare case of fortune smiling upon someone, the folks at Chicago Dramatists liked his stuff and decided to give him a full production. That’s how Jade Heart was born. 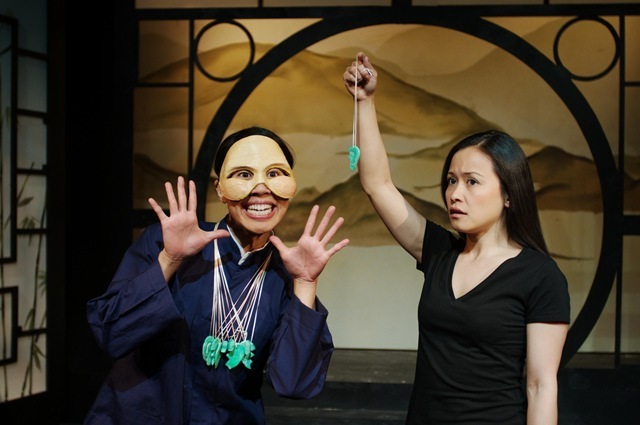 The play explores mother/daughter relationships of all shades, centering on a Chinese girl that was adopted by an American woman. Unfortunately, the uneven show doesn’t really cover any new territory. Jade Heart brings up all sorts of questions about identity, culture, nationality, and family. We flash forwards and backwards through the life of Jade (Christine Timbol Bunuan), as she struggles to connect her past with her present. Jade, you see, was abandoned at birth by her unknown Chinese family, probably a result of the one-child policy enacted in 1979. While she was an infant, she was adopted by American single mom Brenda (Ginger Lee McDermott). 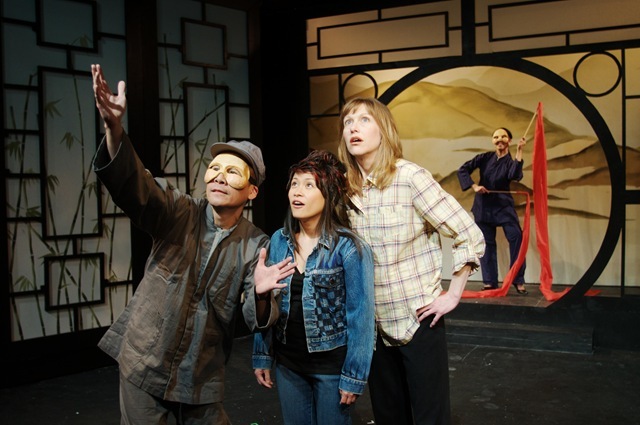 Most of the play involves Jade interacting with Brenda and her imaginary Chinese mother, along with the more basic challenges of growing up. Wheeler’s argument gets pretty repetitive; throughout the piece, others identify Jade as Chinese-American, and she constantly rebukes them and claims that she is only American. While this is a valid question and an interesting look at national and cultural identity, the subject gets popped into far too many conversations. If these were condensed down, the play would probably be 20 minutes shorter at least. Another repetitive debate dropped throughout the play is the status of Brenda and Jade’s relationship. How exactly is Brenda a mother? And how does she relate to Jade’s actual birth mother living out in rural China? Again, important questions, but they get dulled down by overuse in the script. Wheeler’s script revolves around a few points, and the production wears them all down by the end instead of throwing in new and exciting information. Although there are some interesting expressionistic touches, such as Jade’s discussions with her masked (imaginary) biological mother, as a whole the play comes off as stale and clichéd. Not that there aren’t some touching performances in Chicago Dramatists’ production. Bunuan is cute and charismatic. She charms the audience into joining her on her journey. McDermott does a fine job, too, though she gets sort of cheated by the script. We get the vague idea that she is a good mother, but we never see much of the happy times. We witness plenty of sobs and racist/xenophobic tirades, but not a whole lot of a healthy mother-daughter relationship. McDermott commits fully to the role and finds the love where she can, but there just aren’t enough scenes showing us why we should care if Jade and Brenda can connect. 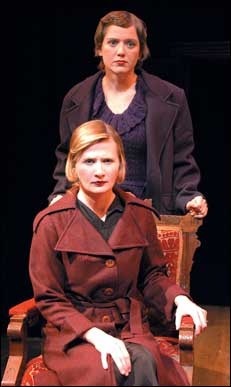 These two women are given a fair amount of support by the other actors on-stage. Gordon Chow, for example, pulls double-duty as Jade’s love interest and masked Chinese tour guide, giving both characters life. Russ Tutterow’s direction keeps the show moving. Nothing really lags here, even though Wheeler often writes in circles. The play does get a push towards the second act, and it finally feels like we are covering new territory. Some of the abstract choices make the world interesting as well; the dialogues between Jade and the mom in her mind are probably the most innovative part of the script and production. Unfortunately, even though the Jade Heart sets itself some very important narratives (identity, culture, assimilation) it doesn’t say anything new about any of them. Everyone involved attempts to drive the story forward, but there just isn’t a whole lot to hook onto. Frost/Nixon takes audiences inside the real-life 1977 television interviews between journalist David Frost and former president Richard Nixon. It has been three years since Nixon resigned from office in disgrace. The Watergate scandal is still on the minds of many, but the former commander-in-chief has yet to break his silence about his role in those events. Now Nixon has agreed to be interviewed by the up-and-coming British broadcaster David Frost. Behind-the-scenes it’s a battle of egos for the upper hand in controlling history, but as the cameras roll, the world is riveted by a remarkably honest exchange between one man who has lost everything and another with everything to gain. Commissioned by TimeLine Theatre Company in 2008 and developed here in 2010, Mastering The Art is a look at the lives of Julia and Paul Child as they meet, fall in love and embark on a transatlantic journey of discovery together. Visiting pivotal moments in their lives — from the table in France where Julia fell in love with food, wine and Paul, to the table in their home where Julia recreated everything she learned in cooking class, to an interrogation room where Paul was grilled by U.S. agents about alleged Communist contacts — this play unfolds the true story of a larger-than-life culinary icon as she and her husband struggle to find themselves as Americans abroad. Mastering the Art marks the first production commissioned by TimeLine to be produced on the company’s stage. The development of Mastering the Art has been partially supported by The Dramatists Guild Fund. The Front Page is a 1920’s classic Chicago comedy often considered responsible for defining the newspaper business. 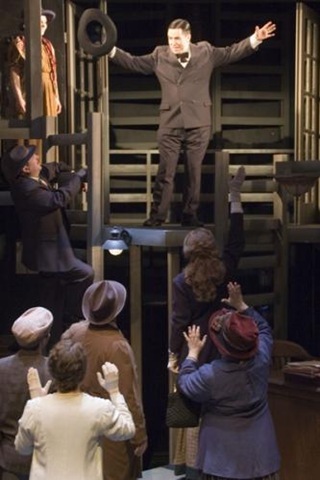 Drawn from Ben Hecht and Charles MacArthur’s careers as journalists in Chicago, the play takes you inside the press room at Chicago’s Criminal Courts Building as a group of reporters cover a controversial execution and uncover the rampant corruption, scandal and hi-jinx associated with Chicago politics and journalism. TimeLine is thrilled to revive a quintessential Chicago classic and to highlight for audiences the wealth of local history embedded in this script. Casting for all productions in TimeLine’s 2010-11 season is still to be determined. Event begins at 6:30 p.m. Show begins at 7:30 p.m.
For reservations call 708.795.6704 x105 and mention "Theater Thursdays," or buy online at www.16thstreettheater.org. for Chicago foodies and theater enthusiasts alike. 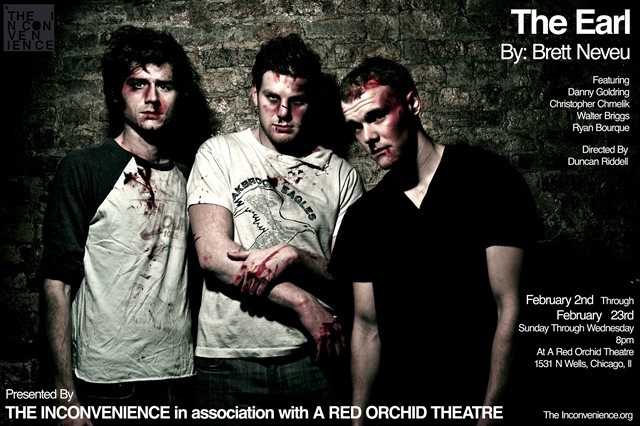 Just in time for the elections, we bring back our critically acclaimed, award-winning production of Nixon’s Nixon. This box office record-breaking production returns to our most intimate theatre for a limited engagement. Artistic Director Michael Halberstam will once again direct William Brown and Larry Yando as they reprise their tour-de-force performances as Kissinger and Nixon in this thrilling, hilarious and brilliantly imagined story of what might have happened in the Lincoln sitting room the night before Nixon resigned. When a charismatic young drifter arrives in a small Kansas town on the eve of a Labor Day picnic, the simmering repressions of its residents come rapidly to a boil. Frequently hilarious and profoundly mo ing, Inge’s masterpiece chronicles the hopes and despairs that lie between the realization of adulthood and the eternal optimism of youth. This American classic is staged by Chicago’s own David Cromer, whose previous work for Writers’ Theatre includes The Price and Booth, and whose highly acclaimed production of The Adding Machine is enjoying a successful run in New York. When the mistress is away, the maids will play. Two women in service to a younger socialite pass the moments of their day in play-acting and fantasy. As the line between fantasy and reality begins to disintegrate, their games take a deadly turn. Jealousy, resentment, sexual tension and murder converge in this 1947 classic French thriller. Jimmy McDermott, one of the city’s most exciting young directors, brings his trademark edginess to this seminally rebellious play. Artistic Director Michael Halberstam masterfully recreates the greatest ghost story ever written with his tour-de-force solo performance of Ebenzer Scrooge’s journey over the course of one magical Christmas Eve. Now in its 13th season, this holiday tradition has been extended to nine performances after last year’s sold-out run. William Brown, director of last season’s triumphant As You Like It, turns his attention from the old to the new. One of the country’s hottest young playwrights, Brett Neveu, brings us the world premiere of Old Glory.This gripping drama in which a family confronts loss as a conseqwuence of war is brought intensely to life through Neveu’s direct yet poetic language. No government, no politics, just people. Razor sharp wit and fiercely emotional confrontation combine as this viscerally powerful mystery unfolds. After his unanimously acclaimed New York debut, The Adding Machine, Writers’ Theatre Associate Artist Josh Schmidt has become the most eagerly anticipated young musical theatre composer in the country. Schmidt’s second creation, in collaboration with artistic director Michael Halberstam, playwright Austin Pendleton and lyricist Jan Tranen, receives its world premiere in Glencoe. A poet, a preacher and his wife enter into a delicious conflict when a fantastical assumption turns an ordinary day topsy-turvy. 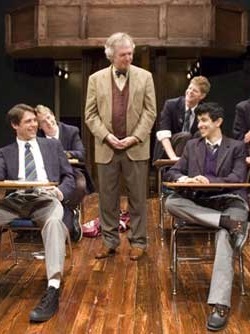 For more information on Writers’ Theatre, call 847-242-6000, or go to www.writerstheatre.org.